Congratulations to the Umóⁿhoⁿ Language & Culture Center (ULCC) department at our school! 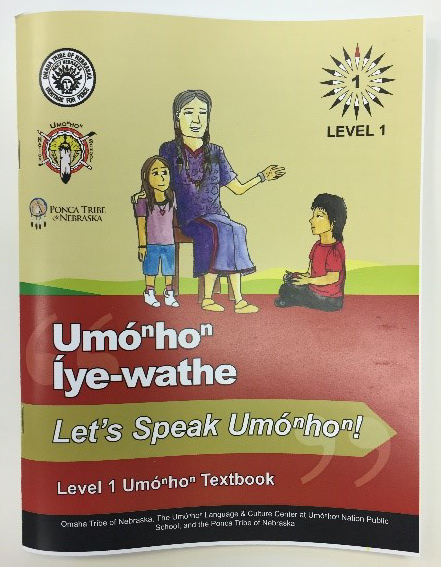 A yearlong endeavor resulted in the first published Umóⁿhoⁿ Íye-wathe, ‘Let’s Speak Umóⁿhoⁿ’ Level 1 textbook. The textbook came from a partnership between the ULCC, the Omaha Tribe and The Language Conservancy. The textbook honors the work of the late Marcella Woodhull Cayou, Donna Morris Parker and Susan Freemont. ULCC Director, Vida Stabler, began documentation 17 years ago which eventually led to the Level 1 textbook. The textbook will immediately benefit the language programs at Umóⁿhoⁿ Nation Public School, Walthill Public School, St. Augustine’s, the Nebraska Indian Community College and other programs in Macy beginning in August 2017. Eventually, the Level 1 textbook will also be a resource to help teach Umóⁿhoⁿ language in other communities. I would like to acknowledge the work of ULCC Staff, Rufus White, Pat Phillips, Rex Webster, Evan Saunsoci, Karen Tyndall, Loretta Webster and Vida Stabler for their dedication to our children. Also, Linguist Bryan James Gordon for all his careful hard work. Thank you all!